Boston Conservatory violinist and teacher Irina Muresanu had high praise for the dynamic young soloist Stefan Jackiw when she welcomed him to the Seully Hall stage last Sunday as part of the BoCo String Master series. One of “the classiest of violinists,” she noted, and with Jackiw’s penchant for performances that combine intellectual curiosity with visceral expression to produce a unique interpretative voice, she probably is right. The hall was filled with local string players in addition to music enthusiasts, and some converts still wide-eyed from his nuanced, deeply felt traversal of the three Brahms Sonatas at Calderwood Hall a few months back [reviewed here with somewhat less enthusiasm] ready to hear what insights he might bring to this unusual program. It combined early and late 20th-century masters with an impeccably performed Romantic warhorse, in something of a meditation on expansiveness and the art of sustain. Jackiw dug into Ravel’s Tzigane, a gypsy rhapsody filtered through the composer’s cosmopolitan sensibility, with a sound that was big, raw, and rhythmically explosive without losing a strong core, as virtuosity opened the program. This artist never sacrifices tone for power and with the sonic billows that come from his instrument, it’s clear he simply doesn’t have to. 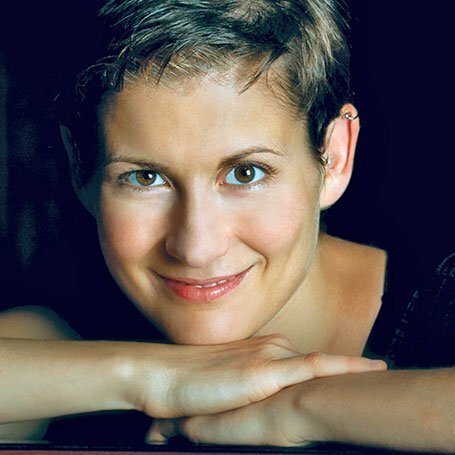 As Jackiw’s sensitive partner, pianist Anna Polansky entered in the role of the orchestra, the piece moved beyond its improvisational opening to a series of kaleidoscopic variations. Here the pair brilliantly rendered extremes of texture and dynamics, shifting drastically with Ravel’s protean language. Polansky followed Jackiw with subtlety, creating impressive ensemble. Having dispatched the obligatory showpiece, albeit a musically substantial one, Jackiw and Polansky moved on to the meat, starting with the 1984 Partita by Witold Lutosławski. As Jackiw explained, this work from late in the Polish composer’s career, takes some of its inspiration from the suite of Baroque dances commonly referred to by the same name. But here these dances are wildly transformed into a series of five movements—three substantial sections split with two aleatoric (chance) interludes, featuring metrically undefined sections designed to obscure the relationship among the parts. Jackiw’s sound shifted entirely, in order to enter Lutosławski’s world. His vibrato closed, his tone sharpened without stridency, and Tzigane’s virtuosity and freedom were replaced with taut, modernist execution. Jackiw’s quartertones spoke flawlessly, and the driving rhythmic tightness that the piece requires was met with a brutal evenness of accent. The central Largo constitutes an emotional and structural center, which Jackiw played with jaw-dropping emotional investment, sustain, and tonal power. Jackiw announced that he would begin the second half with a short Nocturne (1994) that Finnish composer Kaija Saariaho composed from sketches of her violin concerto, Graal Théâtre, in memory of the recently departed Lutosławski. Then the lights in Seully Hall fell to black, leaving only the soloist, lit by a music stand lamp in stage center, to begin this unaccompanied work. Saariaho’s Nocturne lives somewhere between silence, sul ponticello, and harmonics, admitting only an augmented second melodic snippet that moves obliquely through various tonalities, only to deteriorate into scratchy trills and instrumental noise at the fringes of pitch. In Jackiw’s hands it emerged perfectly shaped, both saturnine and strangely otherworldly, marked by his ability to slowly transform sound from one form to another. The nocturne died away, back into deep silence, a testament to the dedication of the listeners this musician attracts. In darkness and before the audience could applaud, Polonsky began softly intoning the opening, striving chords of Cesar Franck’s 1886 Sonata for Violin and Piano in A Major, the lights coming up after a few bars. This was not just a parlor trick; the darkness for Saariaho’s Nocturne leading attaca to the Frank lent the proceedings a narrative quality and pacing that complemented its equally compelling musico-historical connections. Masterworks by two Frenchmen bracketed the middle pieces, themselves connected in spirit by Lutosławski’s life and death; the yearning Wagnerian character of the first and most compositionally successful movement of the Frank was thus made far more melancholy as an extension of the preceding elegy. Jackiw’s sound was glorious and big-boned, and his phrasing was natural, musical, and perfectly paced, but again, the story was his sustaining line. He never ran out of room to expand during the extended crescendos that rise like mountains in the first movement. He shaped both the large phrases and the smaller that lie within them. Polonsky, with a chance to spread her wings in this substantial Romantic part, did so with subtlety and refinement, combined again with unimprovable ensemble. A transparent interpreter, she matches her partner in intellectual rigor and tasteful approach to rubato and phrasing. One of the advantages of avoiding applause, especially before a sizable effort like the Frank, is how it leaves time for more. Even at the end the pair declined to dispel the mood and leave on a lighter note, offering the final movement of Messiaen’s transcendental Quatour pour la fin du temps, the “Praise to the immortality of Jesus” as their encore. As opulent and full as could be accomplished without sacrificing the profound, meditative quality, this rendering placed a capstone on an evening of expansive and rich playing of the highest order. 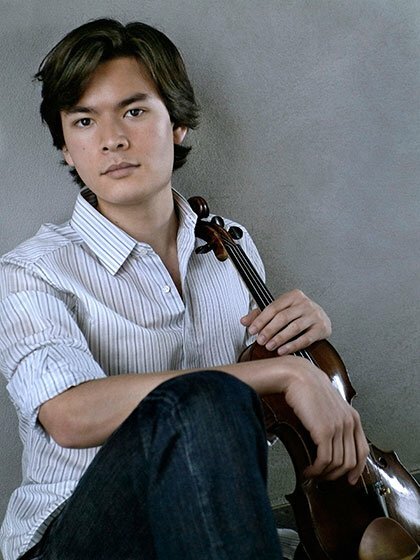 Stefan Jackiw is without doubt one of today’s classiest violinists.